Introducing The Chicago Project Artist, Jason Vaughn! Jason Vaughn is based in Wisconsin. 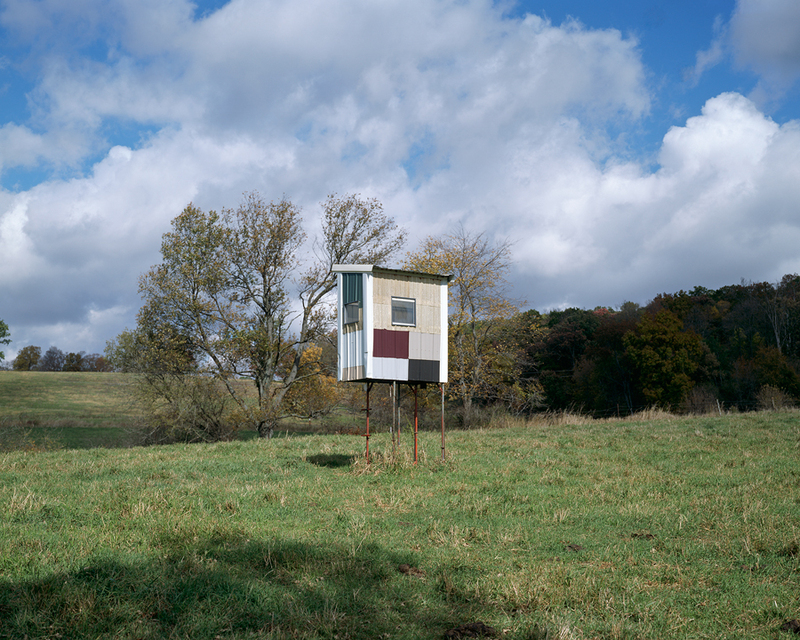 His first major series, hide, is a typological study using Wisconsin hunting stands as a reflection on legacies and family. In 2011, while working on hide, he was diagnosed with leukemia at age 32. After a yearlong hiatus, he completed the series in 2014. It has been met with great acclaim and featured in the New York Times, Slate Magazine, and Artforum, among others. Photographs from hide were included in the Madison Museum of Contemporary Art Wisconsin Triennial and the State of the Art exhibition at the Crystal Bridges Museum of American Art. For this show, curators visited over 1,000 studios in a search for “the most compelling American art being created today.” hide was recently published by Trema Förlag with a special edition by Paul Schiek. 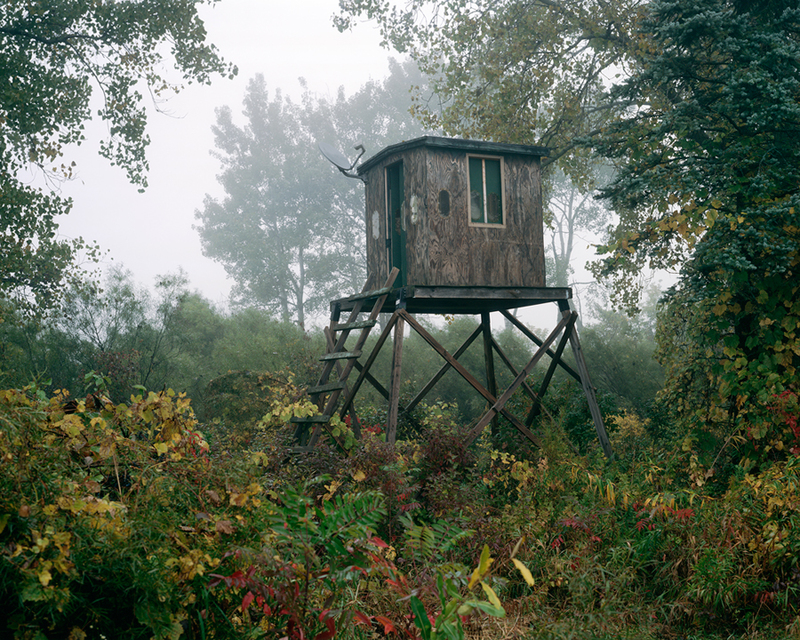 hide is a project that began as a commentary on Wisconsin’s hunting tradition, using deer stands as a metaphor for the changing values of the sport. When my sudden cancer diagnosis interrupted the project, hide took on a much deeper, more personal meaning. I was inspired on my drives through Wisconsin by deer stands, and began having conversations with hunters about the tradition of hunting in their families. Some people described building the stands as something permanent that could be passed to the next generation, especially sons who would inherit the land. I was anticipating the birth of my own son and thinking about my legacy to him, so this idea resonated strongly with me. I also heard hunters emphasize that their pastime is not about violence, but more about oneness with nature and time spent with their children in the stands. I wanted these photographs to capture the serenity of that sentiment, and to suggest the dignity that was associated with hunting when it was seen as a means of feeding large families. Finally, I wanted to look at the issue from a historical standpoint, and the impermanent nature of some of the stands illustrates the fading hunting tradition in Wisconsin, which has declined in recent years. When I was diagnosed with leukemia in 2011, my work on hide was put on hold. I was 32 years old and had a 3-month-old baby at home. Having to face mortality so unexpectedly made me come back to the project with a new perspective on the ideas of permanence and impermanence. Ultimately, hide became my reflection on legacies and family, my homage to the state that has become my home, and a narrative about accepting change. Select images from Jason Vaughn’s hide series are on view in our current exhibition, The Chicago Project VI: Selections from our Online Gallery running through August 29th. We also want to congratulate Jason Vaughn on the recent release of his monograph, hide, along with a special boxset edition through TBW Books! Next > “Every Breath We Drew” is available from Daylight Books!